Fontina is a creamy, semi-firm cheese first made in Italy in the 15th Century. Modern varieties include Italian, Swiss and Danish fontina. Each one has a distinctive flavor, but all are noted for tasting mildly earthy and nutty. Fontina is also a good melting cheese and is often used in cooking. As with any recipe, there are times when a good substitute is required. Knowing what types of cheese to use in place of fontina may make the difference between recipe success and disappointment. Gruyere is another cheese that originated in the Swiss-French Alpines. It substitutes well for fontina because it, too, is a good melting cheese and also has a similar nutty flavor. Note that Gruyere is more firm than fontina and should be grated before using in a recipe. The taste is also somewhat stronger than that of fontina. When choosing a Gruyere, choose an authentic version. 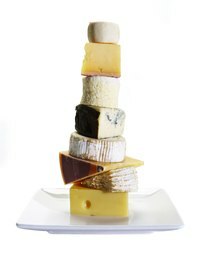 According to a Cook's Illustrated taste test, the domestic versions of Gruyere are pale comparisons to imported Gruyere. Emmentaler (pronounced "emmental") cheese is another possible alternative to fontina. Emmentaler is a creamy, semi-firm Swiss cheese with the characteristic air bubble holes that Swiss cheese is known for. An excellent melting cheese like fontina and Gruyere, Emmentaler also adds its mild, nutty flavor in recipes. Gouda and Edam cheeses can also be substituted for fontina in cooking. They both come from Holland and are similar cheeses except that Edam is made with part skim milk and Gouda is made from whole milk. Both have a smooth, firm texture and are noted for their buttery, nutty taste. When aged, Gouda and Edam also exhibit a slightly sweet and more complex flavor than fontina, Gruyere or Emmentaler cheeses. Provolone and mozzarella cheeses have the distinction of being easy to acquire. Both originated in Italy and they're often used in combination on pizza. While provolone has a rich flavor that sharpens with age, mozzarella is soft, mild and creamy. Using a blend imparts mozzarella's excellent melting ability with the rich flavor of provolone.